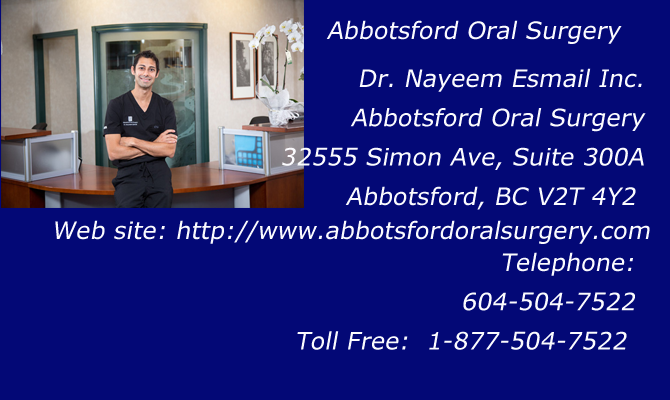 Oral & Maxillofacial Surgeon, Dr. Nayeem Esmail, BSc, DMD, FRCD (C), Abbotsford, BC, practices a full scope of oral and maxillofacial surgery with expertise ranging from corrective jaw surgery to wisdom tooth removal. We can also diagnose and treat facial pain, facial injuries and TMJ disorders, and performs a full range of dental implant and bone grafting procedures. Dr. Nayeem Esmail’s staff is trained in assisting with I.V. sedation within our state of the art office setting. Our office is located at 32555 Simon Ave, Suite 300A, Abbotsford, BC. Call us at 604-504-7522 or toll free 1-877-504-7522. 24 Hr Emergency Service – 604-504-7522 or toll free 1-877-504-7522. Dental implants are changing the way people live. With them, people are rediscovering the comfort and confidence to eat, speak, laugh and enjoy life. For more information about dental implants or to schedule a consultation appointment, call our office in Abbotsford, BC at 604-504-7522 or toll free 1-877-504-7522.